The objective for creating the Integrated Multi-Mission Ocean Altimeter Data for Climate Research is to develop a coherent and consistent time series of Sea Surface Height (SSH) from multi-mission altimeter data that meets the most stringent accuracy requirements demanded to provide credible mean sea level estimates for climate research. The development of the SSH Climate Data Record (CDR) is a collaborative effort under the auspices of the NASA MEaSURE’s program from NASA/GSFC, JPL, University of South Florida, University of Colorado, and the NOAA Laboratory for Satellite Altimetry. Figure Caption: Global mean sea level variations from TOPEX, Jason-1, 2 and 3 with respect to 20 year TOPEX/Poseidon mean, plotted every 10 days (color-coded dots). The red line is a linear fit of the smoothed variations (60-day Hanning filter) with GIA applied and with annual and semi-annual signals removed, showing a global mean sea level rise estimate provided on the plot. Figure Caption: Regional mean sea level variations from TOPEX, Jason-1, 2 and 3 with respect to the 20 year TOPEX/Poseidon mean. Currently the data are available for the TOPEX/Poseidon (T/P), Jason-1, Ocean Surface Topography Mission/Jason-2 (OSTM) and Jason-3 primary mission series (TPJAOS). The data begin in September 1992 and are updated quarterly so it only lags approximately three months behind present. The data are available as geo-registered along-track sea surface height anomalies with respect to the DTU15 mean sea surface at 1-second intervals. The data are spatially arranged as 127 revolutions, which start and end at the equatorial ascending node, comprising the ~10-day near-repeat reference orbit. Each data record is a SSH time series at a specific geo-referenced location defined by revolution number and along-track index. A geo-location directory (rev#, index, cycle) permits direct access of individual locations at specific times (i.e. temporal and spatial sub-sampling), providing time, latitude, longitude, mean sea surface reference, terrain type, bathymetry, proximity to coast, and SSH quality assessments (flag word) at each geo-referenced location. The TPJAOS dataset comes in NetCDF files arranged as individual cycles or the entire time series in one file. What makes this dataset unique? The measurement of geocentric Mean Sea Level (MSL) change from satellite altimetry requires an extreme stability of the altimeter measurement system since the signal being measured is at the level of a few mm/yr. This means that the orbit and reference frame within which the altimeter measurements are situated, and the associated altimeter corrections, must be stable and accurate enough to permit a robust MSL estimate. Foremost, orbit quality and consistency are critical not only to satellite altimeter measurement accuracy across one mission, but also for the seamless transition between missions (Beckley, et. al, 2004). The analysis of altimeter data for TOPEX/Poseidon, Jason-1, Jason-2/OSTM (Ocean Surface Topography Mission) and Jason-3 requires that the orbits for all three missions be in a consistent reference frame, and calculated with the best possible standards to minimize error and maximize the data return from the time series, particularly with respect to the demanding application of measuring global and regional mean sea level trends. In an effort to generate a Sea Surface Height Climate Data Record (SSH CDR) from the four missions spanning more than two decades, a number of revisions/re-calibrations to the respective mission’s heritage Geophysical Data Record (GDR) correction algorithms and models were implemented, including a consistent Precise Orbit Determination (POD) strategy that would geodetically tie the multiple missions. The orbits for this time series of altimeter data were computed at NASA GSFC (Lemoine et al. 2016) using Satellite Laser Ranging (SLR) and DORIS data, using the standards described in Lemoine et al. (2010, 2012, 2015), updated to use the ITRF2014 reference frame (Altamimi et al., 2016). The SLR and DORIS tracking data for TOPEX, Jason-1 and Jason-2 were provided with the support of the International Laser Ranging Service (ILRS) (Pearlman et al. 2002), and the International DORIS Service (IDS) (Willis et al. 2010). A few notable advancements towards the development of the SSH CDR are listed here with links to additional information from relevant publications and presentations. Apply consistent, across missions POD strategy to GSFC ITRF2014/dpod2014 replacement orbit (Lemoine et al., 2016), based on most current terrestrial reference frame realization ITRF2014 (Altamimi et al., 2016), and Time Variable Gravity (TVG) realizations (Lemoine et al., 2015). Improved wet troposphere correction algorithms providing enhanced coastal radiometer measurements, rain and ice detection (Brown, 2010, Misra, 2012). Revisions to ocean tide model (GOT4.10) to better account for S2 tidal constituent (Ray, 2011); improved ground truth dataset based on 137 bottom-pressure gauge network to assess ocean tide models (Ray, 2011). Revised pole tide correction (Desai et al., 2015). Consistent non-parametric sea state bias algorithm (Tran et. al, 2010, 2012). Improved dry troposphere correction through recovery of atmospheric tides, resulting in a reduction of the 59-day signal (Ponte and Ray, 2002). Evaluation and application of inter-mission biases derived from validation phases and global tide gauge network (Beckley et al., 2016, update of Beckley et al., 2010). Altimeter stability monitored from a well-maintained 64-site global tide gauge network (Mitchum, 2000, Beckley et al., 2016). Maintenance and improvements to the fidelity of the SSH CDR is continuous through the research activities of the Ocean Surface Topography Science Team (OSTST). As further advancements and/or re-calibrations are made to any of the correction parameters or models, the TPJAOS is recalculated with the most accurate algorithms sanctioned by the OSTST. Notification and details of revisions to the TPJAOS will be provided at this site. Beckley, B.D., N.P. Zelensky, S.A. Holmes, F.G. Lemoine, R.D. Ray, G.T. Mitchum, S. Desai, S.T. Brown. 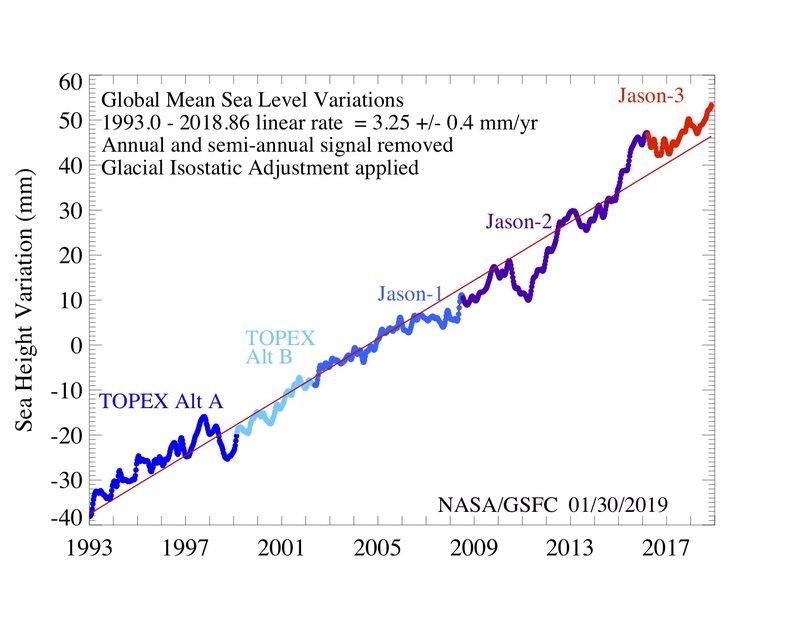 (2010) Assessment of the Jason-2 extension to the TOPEX/Poseidon, Jason-1 sea-surface height time series for global mean sea level monitoring, Marine Geodesy, 33(S1): 447-471, Supplemental Issue on OSTM/Jason-2 calibration/validation, Vol. 1, doi:10.1080/01490419.2010.491029. Altamimi, Z., P. Rebischung, L. Métivier, and X. Collilieux (2016), ITRF2014: A new release of the International Terrestrial Reference Frame modeling nonlinear station motions, J. Geophys. Res. Solid Earth, 121, 6109–6131, doi:10.1002/2016JB013098. Altamimi, Z. and X. Collilieux. (2010) Quality assessment of the IDS contribution to ITRF 2008. Advances in Space Research, 45(12): 1500-1509. doi:10.1016/j.asr.2010.03.010. Altamimi, Z., X. Collilieux and L. Métivier (2011), ITRF2008: an improved solution of the international terrestrial reference frame, Journal of Geodesy, doi:10.1007/s00190-011-0444-4. Beckley, B.D., F. Lemoine, N.P. Zelensky, R.D. Ray, G.T. Mitchum, X. Yang, M. Ricko, D. Vandemark (2016), Assessment of the Jason-3 extension to the TOPEX/Poseidon/Jason Sea Surface Height Climate Data Record referenced to ITRF2014, 2016 Ocean Surface Topography Science Team Meeting, La Rochelle, France. Beckley, B.D., N.P. Zelensky, S.B. Luthcke, P.S. Callahan. (2004) Towards a seamless transition from TOPEX/Poseidon to Jason‐1. Marine Geodesy, 27: 373‐384. Brown, S. (2010) A Novel Near-Land Radiometer Wet Path-Delay Retrieval Algorithm: Application to the Jason-2/OSTM Advanced Microwave Radiometer. IEEE Transactions on Geoscience and Remote Sensing. 48(4): 1986-1992. doi:10.1109/TGRS.2009.2037220. Brown, S. (2013) Maintaining the long term calibration of the Jason-2/OSTM Advanced Microwave Radiometer through inter-satellite calibration. IEEE Trans. Geosci.Rem.Sens., vol. 51, no. 3, pp. 1531-1543, doi:10.1109/TGRS.2012.2213262. Desai, S., J. Wahr, B. Beckley, Revisiting the pole tide for and from satellite altimetry, Journal of Geodesy, 89(8), 747-842, 2015. doi:10.1007/s00190-015-0848-7. Lemoine, F.G., N.P. Zelensky, D.S. Chinn, B.D. Beckley, D.E. Pavlis, Status of Precise Orbit Determination for altimeter satellites at GSFC, 2016 Ocean Surface Topography Science Team Meeting, La Rochelle, France. Lemoine, F.G., N.P. Zelensky, D.S. Chinn, B.D. Beckley, D.D. Rowlands, D.E. Pavlis (2015) A new time series of orbits (std1504) for TOPEX/Poseidon. Jason-1, and Jason-2 (OSTM), Ocean Surface Topography Science Team Meeting, Reston, VA.
Lemoine, F.G., N.P. Zelensky, D.S. Chinn, D.E. Pavlis et al. (2010) Towards development of a consistent orbit series for TOPEX, Jason-1, and Jason-2, Advance Space Research, 46, pp. 1513-1540, doi:10.1016/j.asr.2010.05.007. Lemoine, F.G., N. P. Zelensky, S. Melachroinos, D. S. Chinn, D. E. Pavlis, D.D. Rowlands, B.D. Beckley, R.D. Ray, S. B. Luthcke, Improved Orbit Standards for Altimeter Satellite POD at GSFC, POD Splinter oral presentation 2012 OSTST, Venice Italy. Misra, S. and S. Brown (2011), Application of a Mixed-Pixel Algorithm to TOPEX for Coastal Wet Tropospheric Delay Retrieval, 2011 Coastal Altimetry Workshop poster presentation. Mitchum, G.T. (2000) An Improved calibration of satellite altimetric heights using tide gauge sea levels with adjustment for land motion. Marine Geodesy, 23: 145-166. doi:10.1080/01490410050128591. Pearlman, M.R., J.J. Degnan, and J.M. Bosworth (2002) The international laser ranging service, Advance Space Research, 30(2), 135-143, doi:10.1016/S0273-1177(02)00277-6. Ponte, R.M. and R.D. Ray. (2002) Atmospheric pressure corrections in geodesy and oceanography: A strategy for handling air tides. Geophysical Research Letters. 29(24). doi:10.1029/2002GL016340. Ray, R.D. (2011) A new "ground truth" ocean-tides dataset based on bottom pressure measurements. Ocean Surface Topography Science Team Meeting, San Diego, CA, 2011. Tran, N., Phillips, E. Bronner, and N. Picot, Impact of GDR_D standards on SSB corrections, Ocean Surface Topography Science Working Team Meeting, Venice, Italy, 2012. Tran, N., D. Vandemark, S. Labroue, H. Feng, B. Chapron, H.L. Tolman, J. Lambin, N. Picot. (2010) Sea state bias in altimeter sea level estimates determined by combining wave model and satellite data. doi:10.1029/2009JC005534. Willis, P., H. Fagard, P. Ferrage, F.G. Lemoine, C.E. Noll, R. Noomen, M. Otten, J.C. Ries, M. Rothacher, L. Soudarin, G. Tavernier, J.J. Valette. (2010) The International DORIS Service (IDS): Toward maturity, Advance Space Research, 45(12), 1408-1420, doi:10.1016/j.asr.2009.11.018. Zelensky, N. P., Lemoine, F. G., Beckley, B. D., Chinn, D. S., & Pavlis, D. E. (2018). Impact of ITRS 2014 realizations on altimeter satellite precise orbit determination. Advances in Space Research, 61(1), 45–73. doi:10.1016/j.asr.2017.07.044.